A company which allowed customers to resell their digital music "second hand" breached copyright, a US judge has ruled. 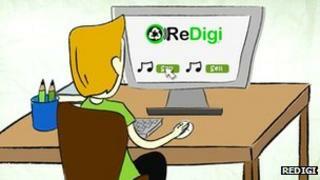 ReDigi billed itself as the first legal way to resell music bought online - but soon provoked the ire of record labels. It was sued by Capitol Records in January 2012, and on Monday a New York judge said ReDigi was making unauthorised copies of music. The ruling could have broad implications for digital reselling. Unlike physical music CDs, Judge Richard Sullivan ruled that the "first sale doctrine" did not apply. The doctrine is a long-established rule which allows the reselling of goods to a new owner. In other words, selling a CD once you no longer want it. But in the digital world, where duplication is much easier, the first sale doctrine was not appropriate, the judge said. "It is simply impossible that the same 'material object' can be transferred over the internet," he wrote in his ruling. "ReDigi facilitates and profits from the sale of copyrighted commercial recordings, transferred in their entirety, with a likely detrimental impact on the primary market for these goods." ReDigi argues that their system means the original download is removed from the seller's computer. The company asks users to download proprietary software, which verifies if a file was bought legally. If the song checks out, it is then erased from the seller's hard drive and uploaded to ReDigi's computer servers. But the judge said: "It is beside the point that the original phonorecord no longer exists. It matters only that a new phonorecord has been created." The notion of being able to sell on your unwanted digital goods is a concept that has caught the eyes of, among others, Amazon and Apple. Both companies have been granted patents relating to the selling or transferring of digital goods - but while both offer cloud storage services for music, neither has yet set up a reselling function. "Both Amazon and Apple have been working on patents, which are insurance policies for both of them in my view," said Joe Wikert from O'Reilly Media, speaking to Reuters. "They have been sitting on the sidelines watching the ReDigi case." Mr Wickert added that the ruling was "not a good first step" for the digital reselling industry. Capitol Records, whose catalogue includes Frank Sinatra's Come Fly With Me and The Beatles' Yellow Submarine, sought $150,000 (£99,000) for each infringement. The judge did not set an amount for damages, instead inviting both firms to submit statements regarding the next steps in the case.